One of Amazon’s unique features is the paid app for free each day for consumers, Free App of the Day, making it easy to discover new apps and games. 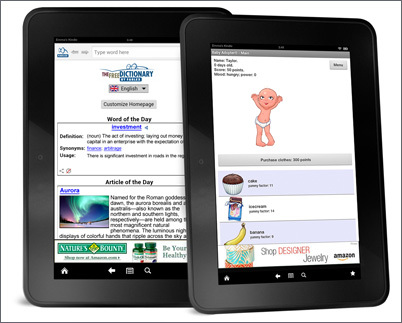 For developers, this presents an opportunity to grow your audience quickly and have your app featured prominently on Amazon.com, the Amazon Apps mobile app for Android, and on Kindle Fire tablets. Many developers have had success by featuring their apps as part of this promotion. One recent success story is EnsenaSoft, a developer based in Mexico that creates casual games like Fantastic 4 in a Row HD and Mahjong Deluxe HD. 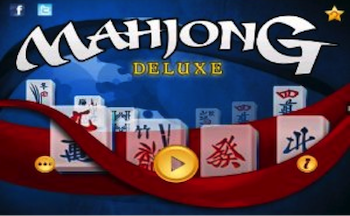 In fact, EnsenaSoft was so pleased with the results of featuring Mahjong Deluxe HD as Free App of the Day, it also wanted to have another one of its games featured. Even with cross-promotion within its apps, Barnyard Mahjong HD had been struggling. After Barnyard Mahjong HD was featured as the Free App of the Day, the free version and the paid version both have had three times as many daily sales compared to sales prior to the featuring as Free App of the Day. Are you interested in having your apps featured in Free App of the Day? If so, let us know here. We review every app and game submitted, and if your app is chosen, we’ll be in touch with you to discuss next steps and ensure you’re on board. Things look a little bit different here at the Distribution Blog. We’ve re-launched and moved it within the Mobile App Distribution Portal to make easier for you to access. If you’re already a blog reader, you know that this is the place to hear the latest news about the Mobile App Distribution Program and Kindle Fire, and that’s not going to change. However, you’ll now be hearing more from our expert technical evangelists and marketing team. I’m Alex Bowman, and I manage our developer social networking channels (including this developer blog) and many of the other channels that connect us to developers. I’ve been at Amazon for a year and a half, and before, I worked in various roles at BlackBerry. When I’m not looking for the coolest new apps on my Kindle Fire, I’m out scouting for the most delicious cheeseburger in Seattle. Mike Hines is our newspaper and magazine specialist, helping periodical developers deploy easily with a great product on Kindle Fire tablets. He joined the Kindle team in 2010, coming from a 13-year stint at Microsoft, doing QA, program, and product management on products like Microsoft Wine Guide and Encarta, as well as some time at an education software start-up. In his spare time, Mike studies political philosophy and enjoys going to Disneyland whenever he gets the chance. Jeremy Cath works with entertainment app developers focused on providing great visual and auditory experiences on Kindle Fire tablets. Prior to joining Amazon, Jeremy worked at Microsoft for 6 years on the Developer & Platform Evangelism team, and prior to that, he spent a decade developing interactive and online experiences to complement television productions. When he isn’t working, Jeremy can be found riding his Harley (or polishing it, given the Seattle weather). Jonathan Wise specializes in optimizing productivity, enterprise, and communications apps for Kindle Fire tablets. Prior to joining the Kindle team, Jonathan spent 10 years as a software engineer working on enterprise-scale applications and web technologies, plus 3 years at Microsoft as a Platform Evangelist. When he’s not up to his elbows in Kindles, Jonathan is pursing a master’s degree in Theology and enjoys helping his 3 young kids discover the world. CJ Frost has been a technical evangelist for Amazon Kindle since the team’s creation. His passion and specialty is bringing great, engaging games to Kindle Fire. A dedicated, console, tablet, and PC gamer, CJ has a 17-year background in software architecture, distributed systems, and enterprise software solutions. Prior to joining the Kindle team, he worked as a Sr. Solutions Architect for Amazon Web Services. Before entering the world of web and gaming, CJ was a police officer and paramedic. Peter Heinrich is a technical evangelist for Amazon GameCircle. Prior to starting at Amazon, Peter developed PC, console, online, and mobile games. When he’s not thinking about achievements and leaderboards, he’s exploring physics simulated, graphics rendering, and embedded hacking. Lauren Stark helps to drive our team’s developer outreach, and is a frequent author and tweeter for @AmazonAppDev. Lauren has been at Amazon for 3 years, and prior to working on the Mobile App Distribution team, worked as a buyer for Amazon’s kitchen store. In her spare time, she enjoys hiking and loves to cook, with a keen interest in finding delicious recipes that only rivals her love of finding awesome mobile apps. Steve Johnson works closely with the teams developing APIs for the Amazon Mobile App SDK, ensuring they provide great experiences for our developers. In his spare time, Steve restores 1980s arcade machines. Mudeem Siddiqui spends his time working with developers, helping them to build great apps and succeed with effective monetization strategies. He received his MBA from the University of California, Irvine. Before he joined Amazon, he worked at various start-ups in the video and semi-conductor space. He also is an avid photographer, and his favorite subject is his 8-month-old daughter. Derek Gebhard also works with developers on building great apps. He’s spent the last 6 months at Amazon, and prior to that, worked on the Windows 8 team at Microsoft. When he’s not working, he’s cheering on sports teams from Detroit. Sanyu Kiruluta has been a developer experience ninja since 2008. When not working to solve key problems for developers she can be found traveling to remote locales, scuba diving in the deep blue or working on her chakra in a Bikram yoga class. E-dan Bloch specializes in software development and usability--making sure we develop the right platform and tools, and helping app developers make the most out of them. Prior to joining Amazon, E-dan spent 15 years as a software engineer developing websites, content management systems and working on system integration. E-dan holds an MBA in Finance & Internet Data Systems and enjoys spending his time working on one of his coding pet-projects, listening to metal or electronic music or watching movies. Lisa Acton is our web store merchandiser. Since she’s been with the Amazon Mobile App Distribution team since the beginning, she has a broad understanding of the Mobile App Distribution Portal and submission process. She’s an avid pinner on Pinterest, and also likes to surprise her co-workers with delicious treats. Rob Pulciani is the fearless leader of the marketing team. Rob’s only been at Amazon for only three months but been in the app ecosystem for years, and considers himself a “tech junkie”. He was previously at Microsoft for seven years, where he was in the Developer Platform Evangelism organization. Rob is married with two small daughters and one very old dog. His spare time is spent shuttling his daughters between dance, soccer, and yoga (if you know why a six year old needs to focus her chi, please contact him as he’d like to know). Paul Cutsinger leads the developer relations team at Amazon. Most recently, he ran engineering for Disney's Club Penguin, after spending some time at Microsoft working on projects including Internet Explorer and Windows. Beyond helping developers build amazing apps, Paul is also a toxophilite (a lover of archery). You may see some other names pop up on occasion, but expect to hear a lot from this team on the latest products and services for app developers, and best practices. We also take your feedback seriously and want to ensure that you find our blog content valuable. Send your blog feedback to mobile-app-marketing@amazon.com. As part of our series of “how to” blog posts, we’d like to provide updated instructions on how to update your app and app’s metadata using the Amazon Mobile App Distribution Portal. Whether you’re submitting new screenshots, an updated description, or a totally new version of your app, these instructions will guide you through the process of getting the updates to your users. Go to the My Apps section in the Distribution Portal. Click on the current live version of your app. Click the “Description” or “Images & Multimedia” tab, depending on what you would like to update. Click the “Edit” button (in the bottom right corner). To remove an existing image, tap the “X” in the top right corner. To add a new image, click the “Upload Image” image. Click the green “Save” button in the bottom right corner. Click the “Submit App” button. Go to the My Apps section in the Mobile App Distribution Portal. Hover your pointer over the app for which you are creating an updated version, and then choose “Add Upcoming Version” from the menu on the right. If no metadata updates are required with the new version, tap the “Binary File” tab, then tap the “Upload Binary” image. Review and certify your app for Export Compliance. Click “Release Notes”, and then click “Edit”. Add in release notes. Click “Save”. At Amazon, we love apps—so much, in fact, that we develop many mobile apps ourselves, and even have an in-house game studio. On the heels of the recent press from the Localytics report that the leading Android tablet is Kindle Fire (with 33% of market segment share worldwide and more than half in the US), we wanted to post some best practices for using in-app purchasing from our colleagues at Amazon Game Studios—developers of the recently released game Air Patriots. Air Patriots is a new type of tower defense game where players control a squadron of airplanes by drawing the attack paths they use to engage the enemy. Air Patriots launched on November 1, 2012, on Amazon, iOS, and Google Play. Although our monetization on Amazon has been great (generating 73% higher ARPU than iOS, and both stores generated similar total revenue), we had some key learning during our initial launch. For example, our focus groups indicated that the two things customers would like to buy were more maps & more planes, in that order. This meshed with our goal of providing Air Patriots customers “big value” for in-app purchases. We reasoned that we would emphasize additional maps for purchase because it would give customers significantly more play time and provide a feel that they paid for something really big and worthwhile. We originally structured Air Patriots to provide gamers 2 of the 7 maps for free, with the remaining 5 requiring an in-app purchase. Additional airplanes were available using the in-game “soft currency” (gears). As a test, we also included a fully-loaded helicopter available via in-app purchase. It turns out that, after launch, the helicopter was our top-selling individual in-app item, and customers were responding negatively to the 5 additional maps. We received feedback that customers were feeling arbitrarily blocked from progressing in the game, which was not our intention! To learn more about the Amazon In-App Purchasing API and Amazon Mobile App SDK, head to our documentation here. To get started with our program, go to the Amazon Mobile App Distribution Portal, and once your app is submitted, submit a request to get your app marketed. Did the launch of your app perform to your expectations? Somer: This was our first release, so we set our install targets based on research and the stories we’d heard from the many developers we’d talked to during our planning. The launch wildly exceeded our expectations. Amazon made sure that parents who knew VeggieTales already--and parents who might not yet know, but would likely love VeggieTales--found our app. We could have made the best app in the world and used the most popular cartoon ever and still failed if we couldn’t get it to the fans. Discovery is a real problem for developers, and the Amazon exclusive took that problem away and allowed us to focus on the app experience. What do you feel are the benefits to selling your app in the Amazon Appstore for Android? Somer: Our apps are based on well-known licensed animations. Amazon’s ability to merchandise alongside related products is very unique and a critical asset when trying to reach the people who already love the properties. Amazon has a special category and Best Seller list for just for kids’ apps; also sells VeggieTales videos, books, music, and other merchandise; has millions of people looking to load up their new Kindle Fires, and the ability to target promotions to all of them. Most importantly though, Amazon had the willingness to work with us and bring forward all their unique merchandising tools in order to set up a great launch promotional program and put our app in front of a very large number of the right people. Somer: We’re looking forward to the next stage as we begin to offer new features and levels in the VeggieTales Spotisode Collection, begin to experiment with Amazon’s In-App Purchasing API and look for new ways to promote our apps with Amazon. Customer Reviews are extremely important to us here at Amazon. While it’s meaningful to make sure that your product description paints a compelling and realistic picture, we can’t always anticipate everything customers will be interested in before purchasing. When a customer leaves a review, they’re helping other customers decide if a particular item is right for them. 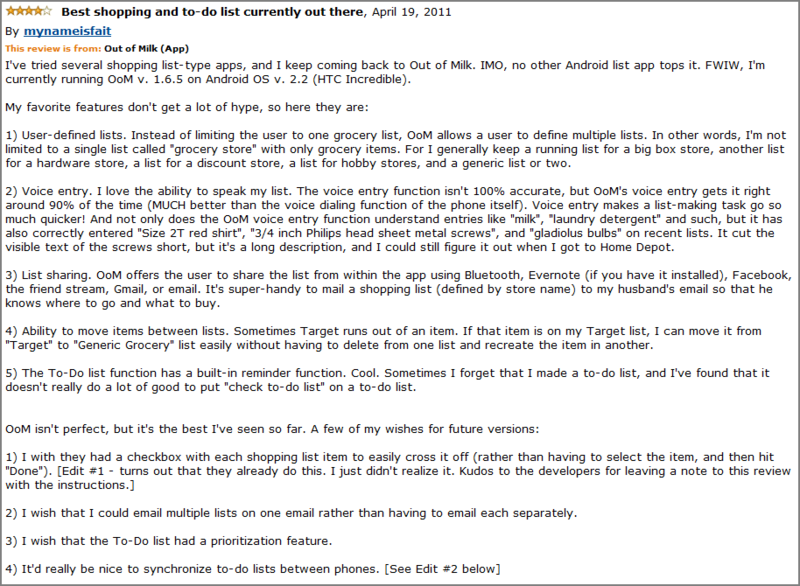 This is just as important for the Amazon Appstore for Android. Customers are likely to view a few similar apps before choosing the one that suits them best and will use Customer Reviews to help make that determination. Paying attention to the reviews on your apps has a lot of benefits. You can use the feedback to decide to add new features and functionality to your app, fix bugs, or make general improvements. While we understand you never want to see less than positive reviews posted about your app, you should take these comments as opportunities to improve your app and better serve your customer base. We give you the option of commenting on reviews so you can show the customer that their feedback is important and you are listening. 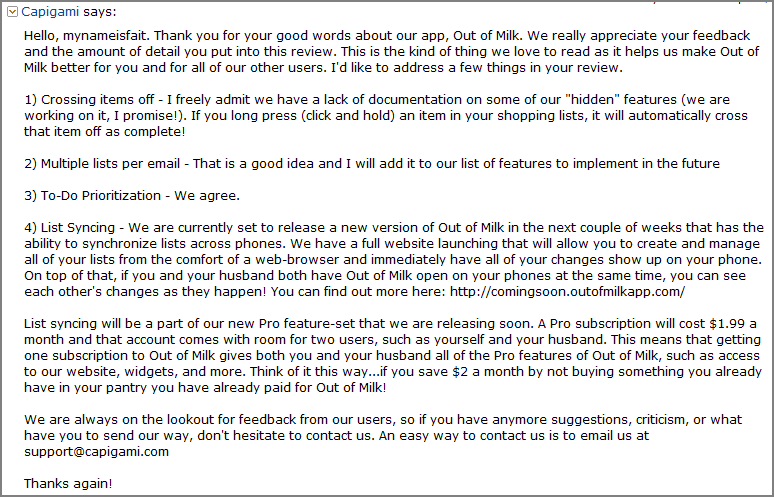 Here’s a great example: Capigami makes sure to follow customer reviews for their app, Out of Milk. A review was posted that shared how much the customer loved Out of Milk but also had a few suggestions on improving the app. Capigami responded with a comment, thanking the customer for the kind words but also going through all of the recommendations and responding to each one. In this case, one of the recommendations was already in development. Amazon pays attention to customer reviews, too. We use that information to make decisions on many things, including which apps to market in various promotions, such as Free App of the Day or the Amazon Appstore for Android merchandising areas. On Amazon.com, customer reviews are an extremely important part of our customers’ purchasing decisions. Ensuring that you stay on top of customer feedback will reward you with good customer reviews, which will get more customers interested in your app and other apps that you develop.